OM-3 Ti was released as the reproduction of OM-3 that had been out of production a long time, and now it is the latest model among the OM series. One of the reason that OM-3 Ti was launched was that it had been great demand on the secondhand market after its manufacture was stopped. 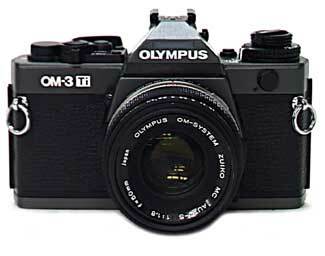 OM-3 Ti features that it employs titanium cover which excels in durablity and heat-resistancy, and strength of six times as aluminum, and what's more, superior performance on flash photography with T-series flash such as direct metering with the flash and super FP sync mechanism enabling the sync-speed from 1 sec. up to 1/2000 sec. While OM-4 Ti is equipped with electronically controlled shutter with aperture priority AE, OM-3 Ti is the full manual operated camera with mechanical shutter except exposure meter. First introduced in November, 1994. Shutter speeds : B, 1 - 1/2000 sec. Body weight : 510 g.